Golden nut shaped cookies known as oreshki are filled with a sweet dulce de leche filling, creating one of the most admired cookie through out the Slavic culture– oreshki. And the good news is you don’t need to stand over a gas stove to make these favored cookies…. 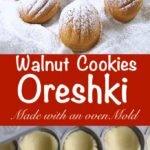 You can purchase an oven mold for these cookies through nakkitchen.com. 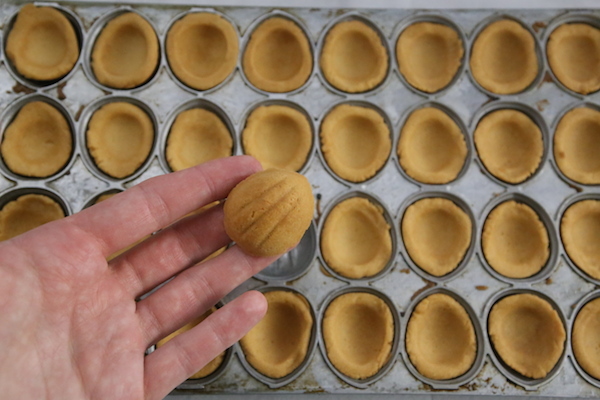 This oven mold holds 40 shells at one time making the cookie process much easier, where-as the stove top version holds about 12 shells at a time. My friend who tried many oreshki recipes wrote “oreshki perfect” on her handwritten recipe. If I can explain the texture of these cookies I would say their firm to their shape yet tend to be on the flaky side, kind of like a butter cookie. I’m assuming the mayonnaise and cornstarch really contribute to that effect. 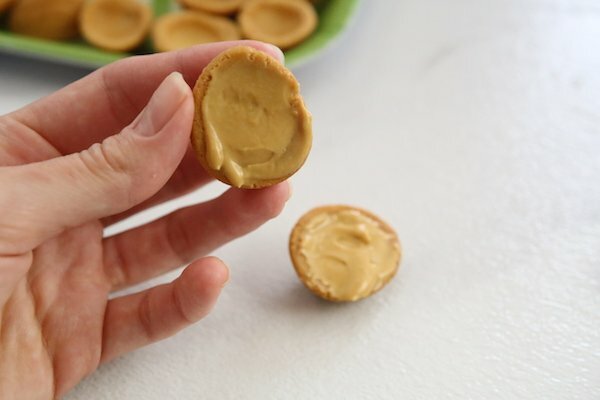 This recipe makes 126 shells (63 whole cookies) and can be filled to your creativity. Make the filling first, as it needs time to set; beat together the filling ingredients and refrigerate until needed. 2. In a medium bowl beat the eggs and sugar until pale and frothy; set aside. 3. In a separate small bowl beat the butter until smooth then add the mayonnaise and mix to combine. Set aside. 4. Dissolve the vinegar with baking soda and set aside. 5. Sift together the flour and cornstarch into a large bowl. Add the egg mixture, butter mixture and soda mixture and beat everything together until a soft dough forms. 6. Cover and refrigerate dough for at least 1 hour before handling. 7. 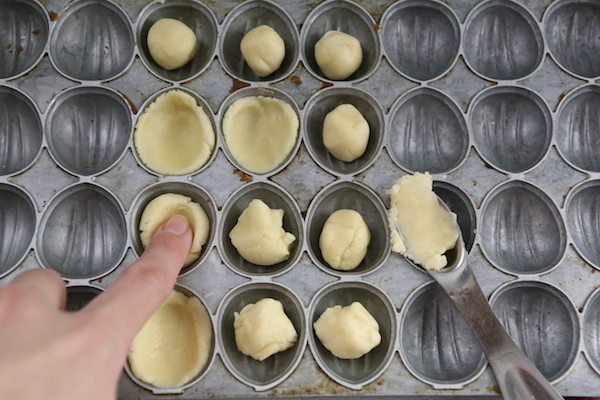 Once dough is cold enough to work with; scoop out 1 teaspoon full of dough into each oreshki mold. 8. Lightly mold in the dough into the cookie iron. 9. Cover mold with the lid and bake in a preheated 375 degree F oven for 30-35 min or until golden. 10. Invert cookies onto a tray and continue to work with remaining dough chilling the dough in-between the handling. Cool cookies completely before filling. 11. 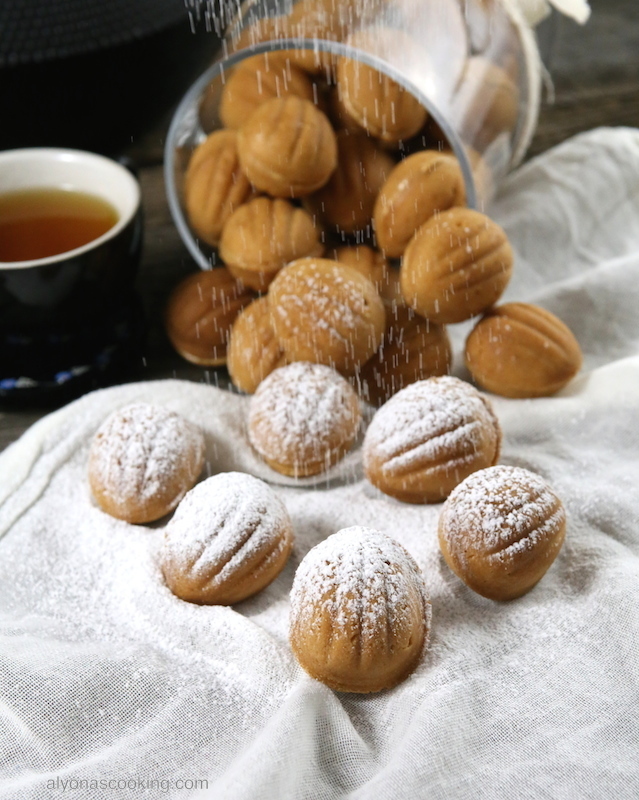 To assemble oreshki; fill each cookie half with the filling mixture and combine the cookie halves to form a walnut shape cookie. 12. Refrigerate shells and serve cold at all times. Enjoy! TO MAKE ORESHKI: In a medium bowl beat the eggs and sugar until pale and frothy; set aside. In a separate small bowl beat the butter until smooth then add the mayonnaise and mix to combine. Set aside. Dissolve the vinegar with baking soda and set aside. Sift together the flour and cornstarch into a large bowl. Add the egg mixture, butter mixture and soda mixture and beat everything together until a soft dough forms. Cover and refrigerate dough for at least 1 hour before handling. 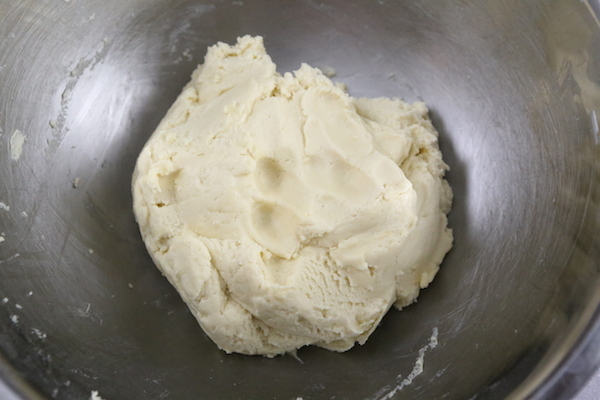 Once dough is cold enough to work with; scoop out 1 teaspoon full of dough into each oreshki mold. Lightly mold in the dough into the cookie iron. Cover mold with the lid and bake in a preheated 375 degree F oven for 30-35 min or until golden. Invert cookies onto a tray and continue to work with remaining dough chilling the dough in-between the handling. Cool cookies completely before filling. 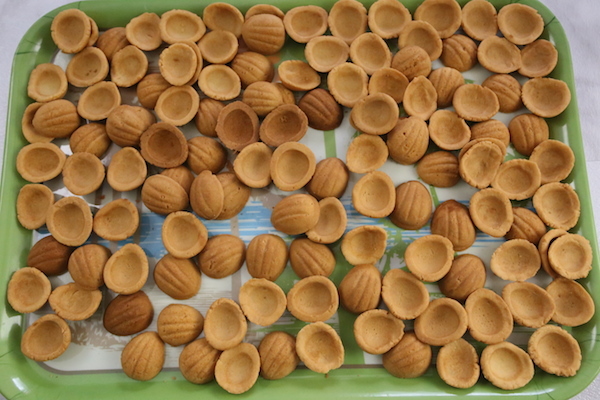 TO ASSEMBLE ORESHKI: Fill each cookie half with the filling mixture and combine the cookie halves to form a walnut shape cookie. Refrigerate shells and serve cold at all times. Enjoy! 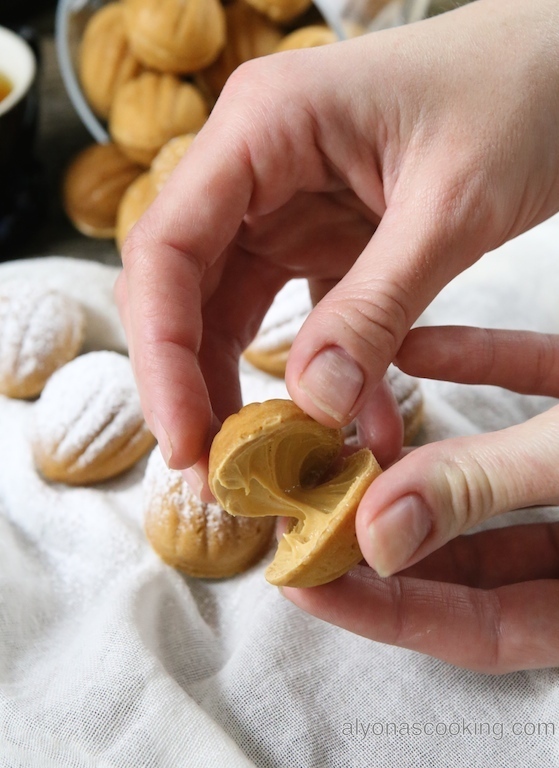 Now if you don’t own an “oreshki” mold but would like a crunchy kind of dessert, check out our Cream Filled Pizzelles Recipe. (I like to beat the eggs with sugar until it becomes very thick. I think the batter comes out very crunchy this way.) I was gifted the pizzelle maker that makes “trubochki”, but if you think you would get much use from it, a pizzelle maker could be something to look into. Hi, Alyona! 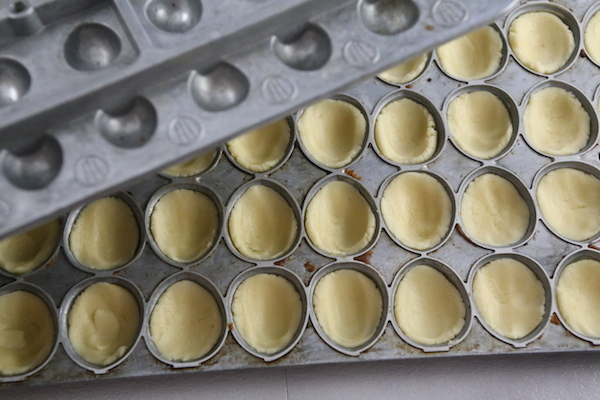 I have a stovetop Oreshki mold and I don’t like it, because it is very messy to make the cokies. It doesn’t matter what recipe, the grease leaks all over the stove top, dough squeezes out all over the mold, and smokes the all kitchen up. How does the Nakkitchen mold work? Is it messy to use it? Does the grease squeeze out as from the mold? Also, do you bake it with the lid on? Thanks! Hi Rozita, I love the oven mold, it is a heavy duty mold. I have never encountered a leakage when baking oreshki cookies in it and yes the lid is to be placed over the top when baking. I have found a teaspoon measuring scoop is the perfect amount of dough for each shell for this oven mold, so if you ever get to work with an oven mold hope that helps you out. Hi Vadim, my oreshki molds are from Nakkitchen.com. I wrote them an email and they contacted me back giving me an address to send my payment to them. It may sound fishy but thats how they were mailed to me. My mother in law ordered them through the same people but over the phone also sending them a form of payment. Once they get the payment they do ship it. These kind of molds were available on eBay before but that option doesn’t seem to be available anymore. I have a question that I don’t know if you can answer. My father-in-law’s family comes from Croatia/Poland/former Yugoslavia (I get a different answer every time). He talks about the oreshkis his grandmother made, but the oreshki recipes I’ve found do not match his description. He says they were fruit filled and more like the kolacky recipes I’ve found. I’m not sure if he’s confusing the name with a different item, or if his family called them oreshki when they were kolacky. Do you know of a fruit filled version? Any thoughts are much appreciated. The oreshki cookies I’m familiar with are more of a cookie texture, usually with some kind of dulce de leche filling. Kolacky seem to have more of a softer texture and I’m not sure if they will turn out in a oreshki mold. Filling oreshki with all jam may not be good idea since the shells can get soggy from the jam. Were the oreshki made by his grandmother in a mold or hand made? Im assuming dough for the mold should have butter or fat content to not stick to the molds…. How many grams is the can? Is that condensed milk or evaporated? Sorry we don’t have those names in Australia.